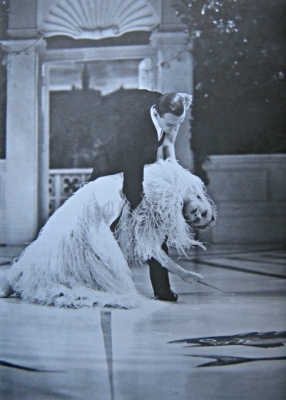 Because the dancing chemistry between Astaire and Rogers will never be accomplished by anyone else. They would melt as one, and the way they danced together was unique. It was so special, that all the other times they did it with different partners, it just wasn’t the same. For now, I will have to content myself with a scene from a Fred-only movie, Royal Wedding. This film was released two years after his last collaboration with Rogers, which took place in 1949 with The Barkleys of Broadway -not the best one. Royal Wedding is not Astaire’s most famous movie. It’s not the most important one of its director, Stanley Donen, either, since he would do Singin’ In The Rain one year later. Still, the “You’re All The World To Me” scene below is a musical moment worth watching. Let yourself get mesmerised by Astaire’s dancing, because there will never be another one like him -or like Gene Kelly, they were both the kings. One wishes all men were like them. And, if you are wondering how they did that gravity thing -although it seems obvious-, they just fixed the camera to the “box” that is the room. Note: If you want to get initiated into the F&G world, I would suggest you start with either The Gay Divorcee or Top Hat. You can relish “Night and Day“ in the first one, and the latter one has great pieces such as “Cheek To Cheek“ or the one that gives the film its title. By the way, I will be the happiest girl in the world the day someone films a biopic of Fred, starring Hugh Jackman. And he shall do “Let’s Call The Whole Thing Off“. HE. SHALL. DO. IT. *Fred Astaire and Ginger Rogers, of course.